NASA astronaut Dr. Peggy Whitson embarked on her third mission to the International Space Station (ISS) in mid-November. Peggy grew up on a farm in Iowa, and was an active 4-H member. 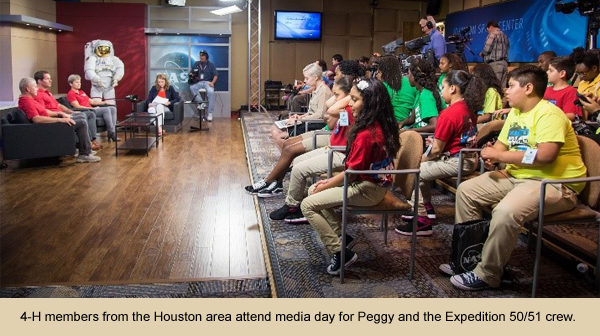 In a recent video produced by NASA and shown on PBS American Graduate Day, Peggy talked about the importance of 4-H in her life and today in the lives of millions of youth; see the interview at https://www.youtube.com/watch?v=NYWk9v0jKYc . became the oldest woman in space. She celebrated her 57th birthday aboard the ISS. became the first woman to command the ISS twice on April 9, 2017. In her first mission, Expedition 5/6 in 2002, she was named NASA’s first Science Officer. In her second mission in 2007-08, she became the first woman to command the ISS for Expedition 16. After returning from Expedition 16, she became the first woman appointed as chief of the NASA Astronaut Office. During her first two missions, Peggy performed six spacewalks, totaling 39 hours and 46 minutes. 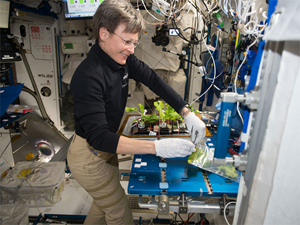 While Peggy is in space, NASA and 4-H will release a series of learning activities about how NASA prepares crews to live together in space and how youth can develop these skills for their personal lives and future education and careers. The project will be announced in December 2016 and will become available online in monthly installments on the NASA and NIFA 4-H web sites during January – April 2017. Members and Leaders joined the national movement to support of the war effort: raising and preserving food, recycling clothing, raising money for special support projects. April 2017 has been dedicated as a month to celebrate community service and service-learning throughout 4-H. The month of celebration will culminate with a National 4-H Day of Service on Saturday, April 29. 4-H’ers will undertake club, community and state service projects as part of the “True Leaders in Service” initiative in honor of National Volunteer Appreciation Month. 250 4-H’ers recently met at the to analyze data about the health of their communities. The 4-H Geospatial Leadership Team helped others access the data and interpret the findings, comparing the health of their communities with that of others in the state, and pinpointing gaps in health care. How Old is the 4-H Flag? 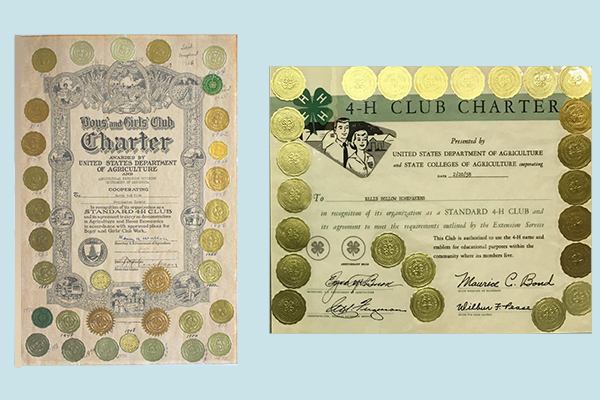 We know the National 4-H Supply Service (4-H Mall) marketed 4-H flags in 1925, the year it started. Do you know of any 4-H flag older than that? Let us know. An Indiana 4-H’er designed a scientific experiment with chicken embryos to be carried into space on the 1986 Challenger mission, but it was lost in the explosion. Redesigned, “Chix in Space” went up in 1989 and was the forerunner of continuing worldwide embryonic research in space by NASA. And this week, 4-H alumna Peggy Whitson sets new records as commander of the current NASA mission. Here on Earth, enjoy the spring-time and this issue! Incorporating 4-H history into state programs presents a creative opportunity. Maine 4-H offers regular written updates to local and county volunteers and staff to keep history front and center in programs. Lt. Col. Ellison Onizuka, a Hawai’i alum and former NASA astronaut, is memorialized iin the renamed Kona, Hawai’i airport. 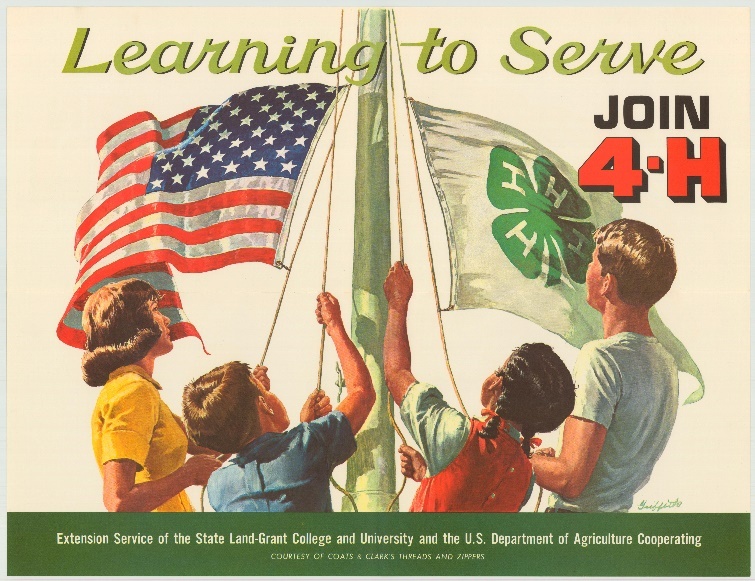 4-H membership and Extension Agent numbers surged as the nation supported overseas troops; food production and preservation, clothing conservation, good health and nutrition were emphases. The collection of originial art produced for the historic 4-H calendar program has grown to 40 pieces, with the addition of four pieces acquired in 2016. You may have an image of the 41st piece in your grandmother’s attic. Enjoy the winter and this Issue! 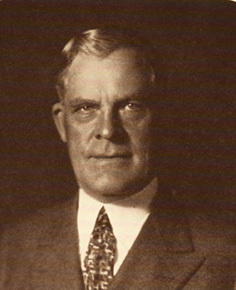 When the National Committee on Boys’ and Girls’ Club Work (now National 4-H Council) was started in late 1921, it basically consisted of a staff of one person – Guy Noble – working at a “desk on loan” in the Chicago headquarters offices of the American Farm Bureau, with the assistance of a part-time secretary (also on loan). In addition to the overwhelming burden of raising funds in unchartered waters and, planning and managing the major national 4-H event, National 4-H Congress, Guy Noble also knew that it was critical to promote the concept of 4-H to broader audiences if it was to grow. As early as 1922, before it was even a year old, the National Committee on Boys’ and Girls’ Club Work became a radio pioneer. Arrangements were made that year with the Westinghouse Radio Service of Chicago for news of Boys’ and Girls’ Club Work to be presented each Monday, Wednesday and Friday at 6 PM. In 1922 there were only 30 radio stations in the country and a quarter million receiver sets scattered across the nation. 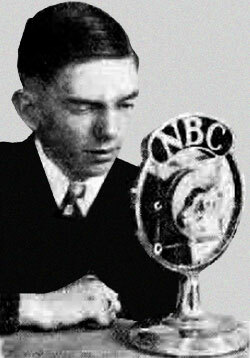 The decades of the 1920s and 1930s became a growth period for both radio and for 4-H together. At one point all the major radio networks were carrying 4-H radio programs. And, there was the National 4-H Music Hour on NBC which featured the United States Marine Corps Band and highlighted music appreciation for young people. The National 4-H News magazine carried a regular column of upcoming radio programs in their monthly publication. David Sarnoff, president of the Radio Corporation of America (RCA), and one of the corporate giants in the communications industry, partnered with 4-H. 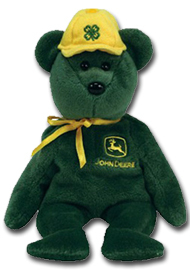 He became a board member of the National Committee on Boys’ and Girls’ Club Work and RCA would become a national sponsor, funding a new activity for 4-H Club leaders and members. It was the National Program on Social Progress which helped to train and encourage 4-H members and adults in their communities to make the community more pleasant and improve the quality of living. This included: being more “neighborly,” and more resourceful, as well as stressing more education and creative community social activities. The program placed heavy emphasis on using the radio for communications. By the 1930s, many rural stations were hiring farm broadcasters; first to announce the grain and livestock markets each day, but then to support rural community activities and events. Four-H fit nicely into this pattern as well; with farm broadcasters becoming strong friends of 4-H. At the same time Extension at every level – federal, state and county – were embracing the use of radio. A decade later, by the end of the 40s, over half of the radio stations in the country were regularly carrying Extension programs, including much coverage of 4-H. The radio was playing in the house, the barn, the car; no longer a novelty, it was a part of our everyday lives. A new segment on 4-H and Radio is on the National 4-H History section of the 4-H History Preservation website. We hope you enjoy it. Take a look at it at: http://4-Hhistorypreservation.com/history/Radio/. 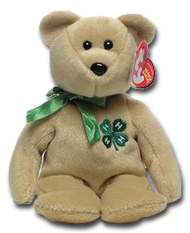 If you have comments about 4-H and radio please contact: Info@4-HHistoryPreservation.com. 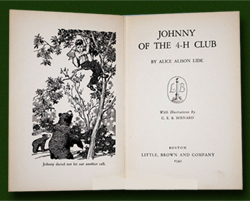 4-H novels and children’s books may not be well known in today’s 4-H; however, starting in the 1920s and in every decade since then, new ones have appeared. 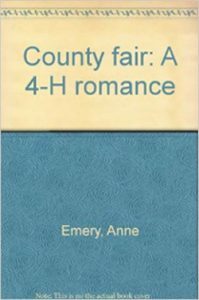 Several dozen titles are documented and, at one time, Miss Gertrude Warren from the 4-H USDA office issued a listing of “approved” 4-H juvenile literature. 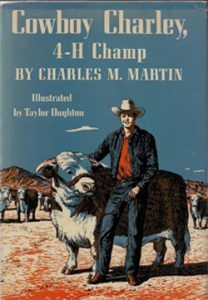 While current research has not uncovered this listing, many of the titles are included in the “4-H Novels” segment of the “4-H books and printed archives” section of the National 4-H History Preservation website. 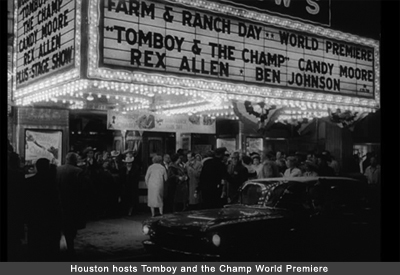 “Tom Boy and the Champ,” a 1961 Signal Pictures’ production and released by Universal International-Films, starred Candy Moore, Ben Johnson, Jesse White and Rex Allen. 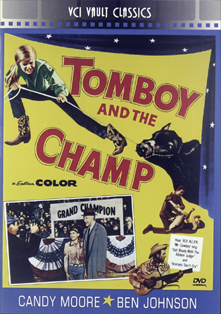 Tommy Jo, a 13-year-old Texas ranch girl, wins a calf at the county fair and names him “Champy.” While training the animal, Tommy Jo gets caught in a storm and develops polio. With the help of her aunt and uncle and her parson, Tommy Jo learns to walk again and discovers that the secret of training Champy is to soothe him with music. She enters her pet – now grown – in the Houston Fat Stock Show, but loses when her radio breaks down and no music is available. The parson encourages her to persevere, and with the help of the local 4-H Club, Tommy Jo is able to enter Champy in the International Live Stock Exposition in Chicago. They win the grand championship when the parson sings a song to Champy. 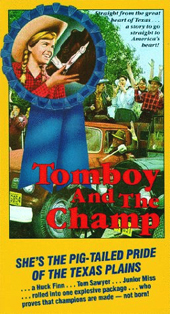 Tommy Jo’s happiness is short-lived, however, as she learns that all champions are auctioned off for beef. Unable to raise the $30,000 auction price, Tommy Jo has a relapse and is rushed to the hospital with pneumonia. 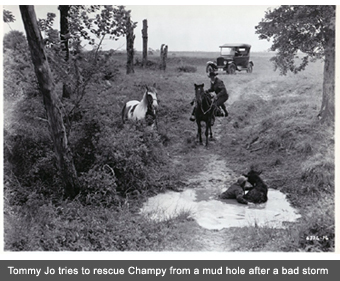 Fred Anderson, a kindly meatpacker, saves Champy from the slaughterhouse and reunites him with Tommy Jo at the hospital. During the International Exposition segment, the film shows the National 4-H Congress parade in the Arena. The film is available in DVD format.